You know those severe hurricanes in the movies that wipe out entire cities, wash away beaches, and render millions of people homeless? The computers at Hollywood’s studios aren’t the only ones cooking these devastating storms – those at the desks of some weather scientists across the United States are, too. As a resident of Florida – you know, that spit of land in Hurricane Alley that eerily seems to break off the U.S. mainland and sink into an Atlantic abyss in every other potential disaster scenario known to man – I get a little nervous. 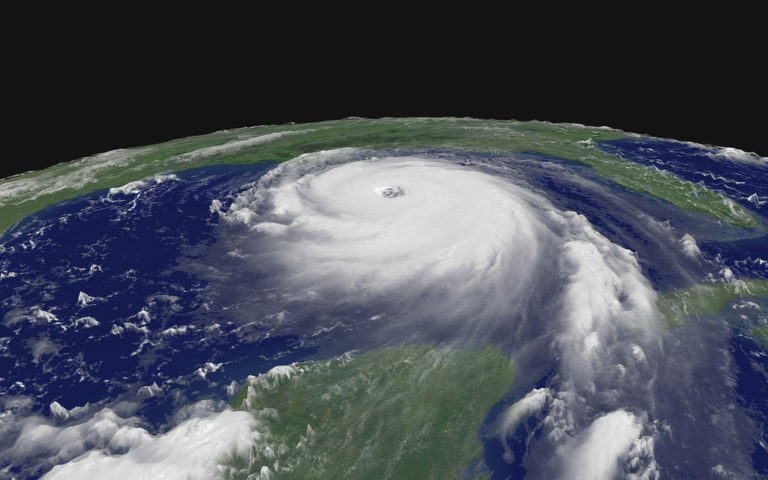 A hypercane is a type of hypothetical storm that would rank as the most severe of hurricanes and could sandblast coastlines and push water miles inland with winds of more than 500 miles per hour. This seemingly unearthly storm could wreak unimaginable damage – the type that only exists in some of the most horrific of disaster films to have ever been concocted. Water vapor would smother the stratosphere and debris could be catapulted miles into the sky. TV news journalists would definitely have to hang onto some pretty well-rooted palm trees while covering that storm! Yet, while it sounds like a mega hurricane is something that could only occur in the movies – and maybe a thrilling cable TV drama – the truth is that hypercanes really aren’t really as far-fetched as they may sound. All it would take is an asteroid slamming into an ocean near the equator or, more likely, an underwater volcanic eruption, to provide the intensely hot water that could spark the formation of a mega hurricane. If the mere idea of hypercanes has you looking for the nearest evacuation route, then get this: the forces seen in a hypercane could far exceed those of any severe hurricanes that have become household names: Katrina, Andrew, Agnes, and Hugo, to name just a few. And, even though Hurricane Camille was the strongest hurricane to ever hit the United States when it whipped up winds of 190 miles per hour across Mississippi and other Gulf Coast states back in 1969, a potentially stronger hurricane could make the winds that Camille churned up feel like a summer breeze. Some 250 people died in that Category 5 storm, and damages amounted beyond $4 billion (in 1969 dollars), yet a storm on an order of the magnitude that some meteorologists have nightmarishly conceived of could rack up untold amounts of damage and kill countless thousands. Will A Hypercane Happen Anytime Soon? As you certainly know, meteorology is still an imperfect science, and sometimes that 50% chance of rain turns out to be a 100% chance over at your house. Yet, absent of some phenomenally rare event such as that asteroid impact or maybe Mount Vesuvius Junior rising out of the sea, chances are you won’t be seeing much about hypercanes on the 24/7 news channels anytime soon. But, as the earth’s climate warms, more severe hurricanes could become an increasingly common reality, and we will have to better understand hurricane facts versus myths, as well as learn how to prepare for and adapt to potentially stronger, more damaging storm systems.